Good morning, dear friends! Today I am drinking a pumpkin machiato from Dunkin’ Donuts and it is strange, but quite tasty. I’m drinking it iced since it’s like 65 out right now and that’s warm enough for me to justify it. I really like iced coffees. I may take up my sister-in-law’s practice of drinking them all year round. Maybe. I’m not sure, yet, if I can bring myself to do it once it gets genuinely cold. I may reserve it purely for Dunkin Donuts coffee as I will no doubt be bringing it back to my apartment where I can be sufficiently warm. Guys, I have a problem. I really like pictures. This is a thing that I have had to come to terms with over my 24 years of life. I really like taking pictures, though I’m not very good at it, and most of all, I really like being in pictures. I know, that’s a weird thing to say. Most people I know are super not into being in pictures and actively try to avoid it if possible. I always want to be in pictures. I want to have pictures of everything, and I love looking at the pictures that were taken. I have a picture problem. The best part of getting ready for my grad party was looking through all the pictures for my collage. Seriously, nothing could have made me happier than sitting in the living room surrounded by memories, while Anne of Green Gables played on PBS. There are some memories I only have because of the pictures that were taken. I don’t remember seeing the horseshoe crab on a beach in New Jersey, but there’s a picture of a family friend holding one up while us kids stared up at it. That moment was captured on film so I can keep it forever. I love old pictures; photos of my parents’ wedding, of their time as young adults at Waldameer or on the beach in Erie. I love even more the pictures of my grandparents that I got to look through before my wedding. 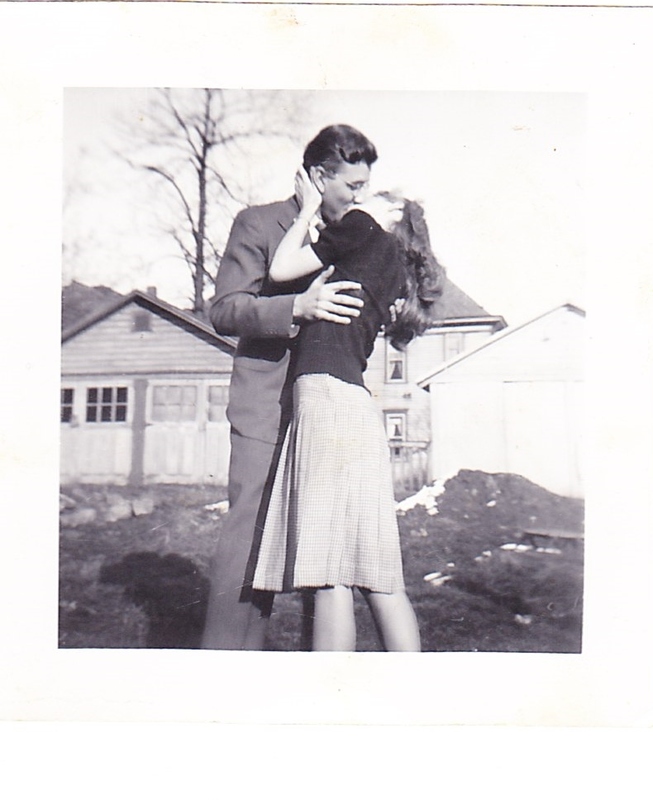 Behold the cutest couple in all of the 1940s. I never met my grandmother on my dad’s side. She died before my parents were married. Still, I always wished I could have known her. She seemed like she would have been such a cool person. So looking at the pictures of their life together was like getting to know her, if only a little. I didn’t really get to know my grandfather either. He died when I was two, but in the pictures he was always smiling with this crooked smile. I’m sure he was a really cool person too. I loved looking at their pictures together, of seeing them young and happy and so in love. I’m still convinced that they were the absolute cutest couple ever. So maybe that has something to do with my obsession with pictures. Maybe it’s this subconscious desire to have documentation of my time here for those future people I’ll never get to meet. Whatever the reason, I really like being in pictures. I’ve accepted this fact and I’m working on being bold about it. My whole life I’ve had this feeling that it’s wrong. It’s vane to want to be in pictures all the time. Everyone else is trying to avoid pictures, I didn’t want to seem overeager or weird or something. But the truth is, I like the attention, I like the opportunity to be photographed, to be captured in that moment. I like the idea of being preserved in a physical memory. I want to collect as many moments as I can to look back on when I have kids and they wonder what mom and dad looked like as kids. When I want to share a moment with them, I want to pull out a picture and be able to show them, this is what it was like on that mountain in Maine on that day when your father and I drove to the top and back down again. I want my grandchildren to be able to see pictures of us and see how super cute we were, and how happy we were together, and how much we loved each other, just in case we don’t get to meet them. I want them to know their legacy of love. This is one of my very favorite wedding pictures. So on Monday we’re having more pictures taken, because I have a picture problem. I’ve wanted to do a ‘one year later’ photo shoot, partially as an excuse to put on my dress again, and partially because I just really like getting pictures taken and it’s a pretty good excuse. I would kind of like to do it every year, but I doubt my husband will be into that, even if we have a willing photographer friend. You should all check out Lindsey Zern, by the way, she’s super talented. In my desperation to justify taking more wedding-y pictures I figured since I didn’t get the fall wedding I had always wanted, I could still at least get the fall wedding pictures to make up for it. And my flowers dried really nicely and will look so good in a rustic fall setting, and I can actually get some pictures with the parasol and fan my mom got me for the wedding, which went mostly forgotten during the actual wedding day pictures. See? Totally worth getting dressed up again and doing pictures. Yes, I have a picture problem, but I’ve embraced it. I love saving moments in time to keep forever. I love having snippets of life saved on my computer and sticky-tacked to my wall. Yes, I still use sticky-tack, deal with it. I love being able to look back and see how happy we were that time at the church cook-out when we were first engaged, or the view from the docks near the lobster pound we ate at in Maine as the sun was setting, or just us goofing off at the park after church. This is why I took a gazillion pictures of my husband putting together our bookcase and the end tables, even though they all look the same. Or why I snap pictures of him cooking when he’s not paying attention. I want to capture every moment and put it in a bottle to keep for always. Pictures are the closest I can get to that, so they’ll have to do.